As a celebration of my moving back to Florida recently, we went to the beach yesterday! How sweet is was to float in the warm ocean water again. And of course I had to search for seashells. The central east coast is not known for it’s abundance of seashells, but I did find a few to take home with me. After the move, from the northeast to the south, most of my things are in storage – including my old seashell collection. That means I have to begin a new one! So here I go – beginning with a piece of a large sand dollar and a shiny Sawtooth pen shell. I also found many arks, which are able to survive the rough surf because of their thick shells. In fact I think the ark is the most often found bivalve on the east coast beach I visit. Everything I found yesterday was a bivalve (shells with two halves), with the exception of the piece of sand dollar. Now that I am able to go out and collect seashells much more frequently, I will study them closer and try to determine exactly what I have. Many types of shells look very similar, yet have different names. Today I learned that the Incongruous ark (Anadara brasiliana) can be recognized by the dashes that appear across each section of their ribs. As you can see (hopefully) in my photo above, the ribs running along the shell are not smooth, but bumpy. To identify seashells, sometimes a close inspection is needed. At first glance, most of the shells I found looked all the same. 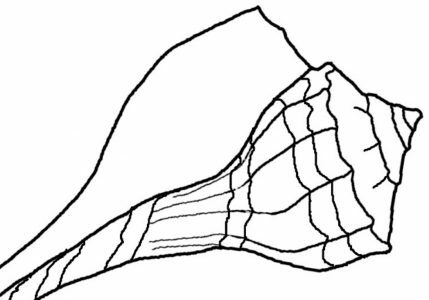 A good identification book will show pictures from the top and bottom of the shell and give a description about how to tell shells apart. It helps to know seashell identification terminology too. Words like “umbo”, “teeth”, “apex” and other anatomy of a mollusk. By the way, I managed to find a couple of Common jingle shells yesterday also! That was exciting. Fabulous finds! & Congratulations on your move to the sunny shores of Florida!